ITALIAN retailer Benetton hopes to shock to world again - and revive its fortunes - with a new advertising campaign, unveiled in Paris yesterday. The fashion brand, which in its heyday set the agenda (at least for getting press attention) with posters including a photograph of a man dying of Aids and a priest and a nun hugging, hopes to recapture its successful past while bringing the brand into the digital age. 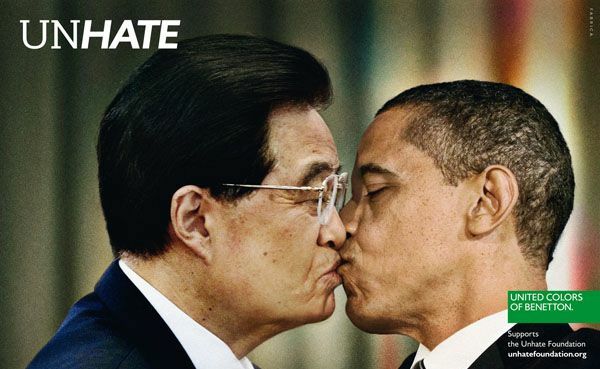 The newly revealed campaign shots, titled Unhate, show world leaders kissing each other - images include the Pope and the Sheikh of the al-Azhar mosque, Angela Merkel and Nicolas Sarkozy, and Barack Obama and Hugo Chavez. They are, of course, the result of digital manipulation. The images have already been banned by The Sunday Times, International Herald Tribune and The Guardian. The head of the company and son of the founder, Alessandro Benetton, told The Independent: "We want to reaffirm the value of the brand. We are going back to the tradition of [Benetton] and will make the most of this. But we are reconciling the past with the future. At this time, when something bad is happening in the world, we want to focus people's eyes on the positives. This campaign is about reconciliation and acceptance." With a nod to the importance of social media to the success of a campaign, 50 per cent of Unhate will be digital and Benetton has set up a "kiss wall" on Facebook; the total spend on the campaign is A10m. The company says will invest 80 per cent of its ad budget on digital media campaigns in future. A charitable offshoot, the Unhate Foundation, has been launched to help countries in need from Africa to South America. Benetton has seen its share price slide in recent years - its most recent annual results revealed profits had fallen 16.4 per cent on the previous year to AUD$102 million, but Alessandro Benetton has recently invested more than AUD $1 billion in the company and plans to revamp flagship stores across the 120 countries it is in. The current trend for bright colours and knitwear - Benetton's core looks - could stimulate interest in the brand again, if only in the short term. Alessandro is hopeful for longer-term growth. "We have deliberately made long term decisions. The choices that a father of a family would make." Alessandro, a former investment banker at Goldman Sachs, took the helm from his father Luciano, four years ago. Luciano founded the firm in Italy in and the family still owns a 67 per cent stake in the company, which is listed in Italy. It remains to be seen whether Benetton can recapture the interest of consumers with its new advertising campaign, or whether the Unhate images will come to represent the midlife crisis of a once-mighty brand.